Hi, I'm Josh from Cal-Mil. Today, I'm going to be speaking to you about some of the beverage dispensers that we have, some of the unique feature and benefits that they offer to you. So, not only do they look great, as you can see up here, they also offer some very great benefits. First, it's very cost-efficient. This is because buying in bulk is much cheaper than buying single water bottles or single juice bottles. It's also a great way to put something behind a bar in a restaurant. If you want to infuse some alcohol, you can pour maybe some middle shelf alcohol into there, infuse it, and it tastes great and it's a great way to present the alcohol. Next, they're very easy and convenient. We offer all these beverage dispensers in different styles, different sizes: range from one gallon to five gallon, glass, plastic, whatever you need. This is a great way to fit the needs to each customer. Lastly, taking normal juice or normal water and putting it into one of these beautiful beverage dispensers is a great way to enhance the customer experience. The next thing that you'll see is the ice tubes running down the center. We offer both the ice chamber, which is solid over here, and the infusion chamber, which is right here. The ice chamber is great because you can put the ice down the center of the beverage dispenser, and it not only is a great way to house the ice, but it will not dilute the water. The infusion chamber, you'll see right here it has slits on it, and this is great because you can put fruit inside of this infusion chamber, and then you can infuse the beverage with the fruit you put inside of here. Not only does this look great, as you can see from the beverage dispensers we have up here, but it's a great way to keep all the pulp outside of the spigot. It's very low maintenance. So, moving on… Along with the infusion chambers and the ice chambers, we offer all the lids, all the bases, all the actual containers themselves as separate parts in case one of them breaks or you need a backup. This is just another great way to show that we go the extra mile for you, and we really want to make sure you guys have the piece on-hand at all times. Because these are all made at our facilities here (we manufacture about 90 percent of our stuff), we can do some very great custom work. Here, you'll see something we did for Tropicana. We can do it for any customer; we can put any label on it. So, it's a very nice way to go about things and create ownership for the product itself. So, as I've shown you, whether you're putting it in a bar, you're putting it in a restaurant, you're putting it in your lobby at a hotel, our beverage dispensers are a great way to enhance any presentation. We're very confident that these beverage dispensers will work great, and they will be beautiful while they're doing it. So, until next time. Beverage dispensers from Cal-Mil provide convenient, cost-effective, and attractive options for presenting beverages. 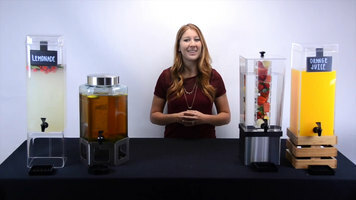 Watch this video to learn more about your beverage dispenser options, including optional diffusers and customizable containers. Hi, I’m Julia, and welcome back to the Cal-Mil classroom. We are so excited to share with you today an episode on beverage dispensers. With spring just around the corner, it’s the perfect time to start planning how you’ll showcase all of your iced drinks. Beverage dispensers are essential for any food service presentation, which is why we’ve created so many different styles, sizes, materials, and colors to suit your needs. Each one of our beverage dispensers includes either an ice chamber or an infusion chamber. Our solid ice chamber is designed to keep your beverages chilled without diluting the flavor. Our infusion chamber, as you can see, is typically filled with fresh fruits, like strawberries, pineapple, blueberries, raspberries, and more. You can even add touches of mint or basil for an inviting and refreshing flavor. This chamber has small openings that allows you to infuse these flavors into whatever beverage you desire. All of our beverage dispensers are commercial grade with replacement parts available. Ranging from 1 gallon to 5 gallon, glass or acrylic, the options are endless. And if you don’t see something you like, we specialize in custom – we can make it for you! It’s our job to make your presentation eye catching and suitable for your environment – let us help you showcase your beverages. Visit us online at cal-mil.com to see our entire selection of beverage dispensers. That’s all I’ve got for you today, I’ll see you next time in the Cal-Mil classroom. With a variety of different sizes, styles, materials, and colors, Cal-Mil can make any foodservice presentation eye-catching with their beverage dispenser collection. Choose from ice chambers or infusers for ultimate versatility! Hey guys, Elora here. And in this week's Cal-Mil classroom, I'm going to show you how to keep your cool during the summer heat by splashing into some icy cool drinks with our most popular beverage dispensers. Our beverage dispenser work in a number of different environments. We have different styles, like the ones shown here, from clear acrylic, stainless steel, glass, reclaimed wood, and more. We offer different sizes; they some in 1 1/2, 2, 3, and 5 gallon capacities. Our beverage dispensers come with your choice of either an ice chamber, or an infusion chamber. An ice chamber is a solid, rectangular tube, which you can fill with ice to keep your beverage cold. With it being solid, you don't have to worry about your ice melting and diluting your beverage with water. 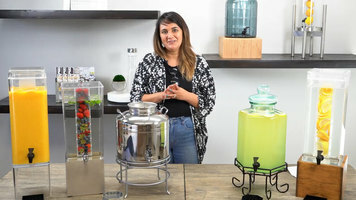 The infusion chamber is a rectangular tube with thin cutouts, which you can fill with strawberries, lemons, oranges, or other ingredient to infuse your beverage with delicious, natural flavors. 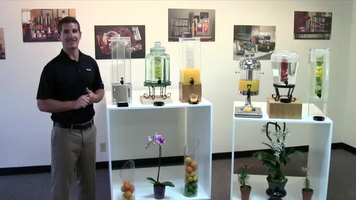 Be sure to check out our beverage dispensers at www.calmil.com, or click the link in the description below. Well, I'm off to enjoy the summertime weather at the beach, and we hope to see you next time at the Cal-Mil classroom. Hey guys, if you haven't already, make sure to head over to our YourTube page at www.youtube.com/calmilproducts. Here you can subscribe to our page, and you can hit the bell next to the subscribe button to make sure you're notified every time we post a new video. Keep cool, and keep hydrated with Cal-Mil beverage dispensers! Available in a variety of materials, styles, and capacities, these dispensers come with your choice of either an ice chamber or an infusion chamber. Learn more by checking out this video. 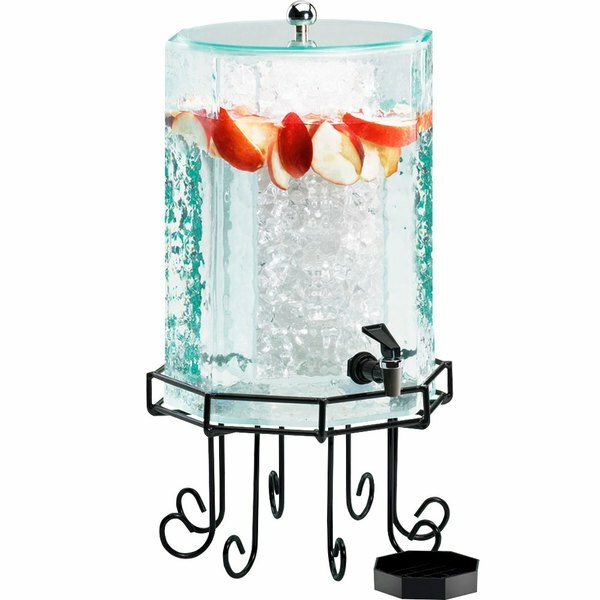 Chill and serve drinks with this Cal-Mil 932-2 glacier acrylic 2 gallon beverage dispenser to add an elegant twist to your modern decor. Made from lightweight and durable acrylic, this octagonal dispenser stylishly displays colorful punch, water, iced tea, and more, making it easy for your customers to view the dispenser's contents. Stunning green-tinted, faux glass is accented by a trendy wire frame base with a black powder coating. Featuring a removable ice chamber, this dispenser keeps your beverages refreshingly cold without the risk of diluting them. A round silver knob at the top of this piece grants easy access for refilling, and the lid, spigot, and base are fully removable for easy cleaning and transportation. Plus, the included drip tray will catch any accidental drips during use to protect your table linens! The decorative yet effective design of this beverage dispenser is perfect for a variety of venues, including hotels, buffets, and catered events. Cal-Mil 3437-3-12 Glacier 3 Gallon Clear Beverage Dispenser with Ice Chamber - 7" x 9" x 26 1/2"
Cal-Mil 3437-3INF-43 Glacier 3 Gallon Green Tinted Beverage Dispenser with Infusion Chamber - 7" x 9" x 26 1/2"
Cal-Mil 3437-3INF-12 Glacier 3 Gallon Clear Beverage Dispenser with Infusion Chamber - 7" x 9" x 26 1/2"
This beautiful glass octagon beverage dispenser, Is great for serving your favorite beverage, I put water and fresh leamons in mine everyone loves it,when we have guests.